How can service metadata be centrally published and governed? Project teams, especially in larger enterprises, run the constant risk of building functionality that already exists or is already in development, resulting in wasted effort, service logic redundancy, and service inventory denormalization. Service metadata can be centrally published in a service registry so as to provide a formal means of service registration and discovery. A private service registry needs to be positioned as a central part of an inventory architecture supported by formal processes for registration and discovery. The service registry product needs to be adequately mature and reliable, and its required use and maintenance needs to be incorporated into all service delivery and governance processes and methodologies. 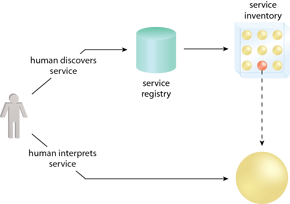 The fundamental discovery process during which a human locates a potential service via a service registry representing the service inventory and then interprets the service to determine its suitability.